Greetings From Albuquerque New Mexico. By Governor and Captain General Don Francisco Quervo [sic] y Valdez ceremonies incident to the founding of the villa of Albuquerque named after the Spanish viceroy Don Francisco Fernandez de la Enriquez Duke of Albuquerque. Marker in Old Town Plaza commemorating the founding of Albuquerque. There are two Albuquerques, Historic Old Town founded seventy years before the signing of the Declaration of Independence – and the new Modern City, one hundred and seventy-four years later. The two places, so different in tempo and appearance, are joined by Central Avenue (U. S. Highway 66). Nestling at the base of the beautiful Sandia Mountains the present Albuquerque is spread out over 100 square miles with a population approximating 100,000. All around is the fascination of New Mexico and the picturesque Indian Country. 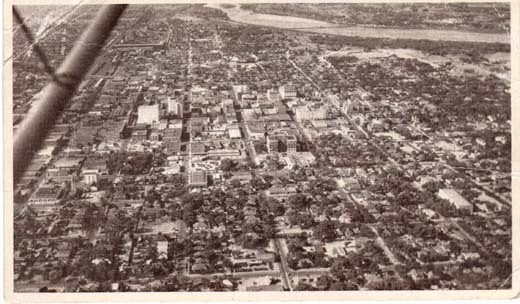 This air view of Albuquerque shows the location of the city on the banks of the Rio Grande, with a compact, modern business district which is the heart of a vast trade territory extending for hundreds of miles. 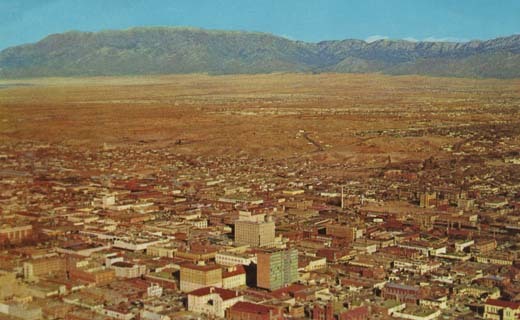 Skyline of City and Sandia Mountains, Albuquerque, N. M.
Coronado and his explorers were the first white men to see these mountains in 1540 and named them the Sandia or Watermelon Mountains. The altitude is 10,000 feet. 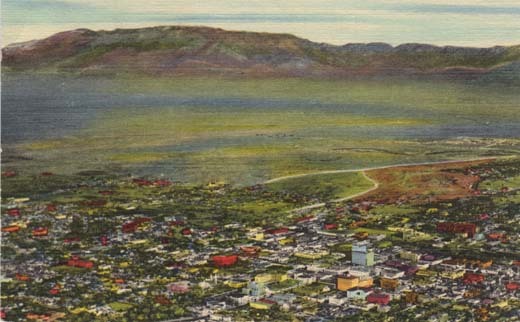 Business Section, Looking South Showing Rio Grande, Albuquerque, N. M.
The metropolis of New Mexico, Albuquerque is situated on the Rio Grande at an elevation of 4988 ft., and is approximately the center of the state. The busy city of today was founded by Gov. Cuervo in 1706 and named for the Duke of Alburquerque. Later the first R in the name was dropped, with the coming of the Americans. 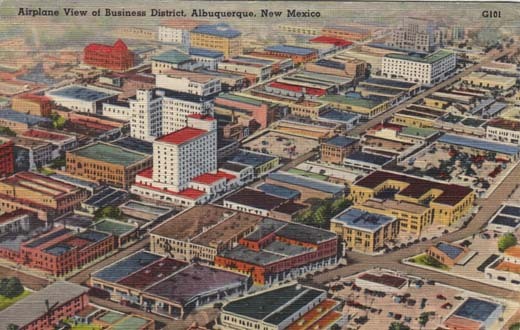 Although the U.S. Census of 1940 gave Albuquerque about 35,000 population, the surrounding trade territory bring it up to about 50,000. It is a thoroughly up to date and progressive city. In the Heart of Atomic America – lies Albuquerque – in one of the most historic and scenic areas of the entire United States. 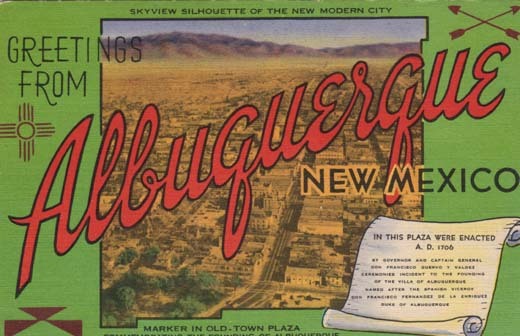 The new and modern Albuquerque is spread out over 100 square miles with a population approximating 100,000. 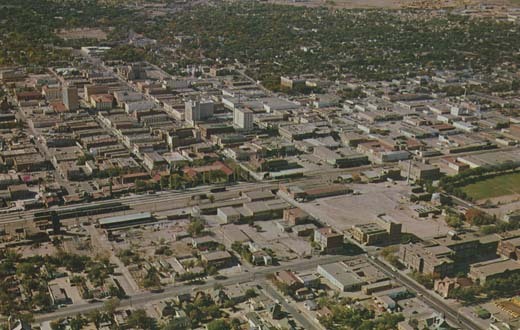 Air View of Albuquerque, New Mexico. 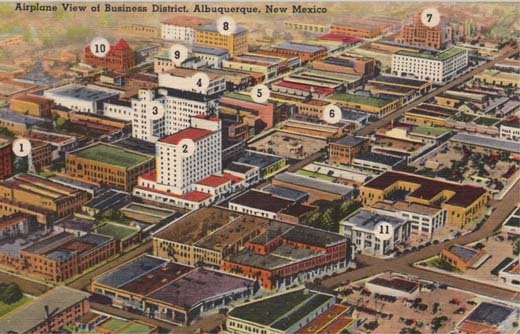 The village of Albuquerque—the present Old Town—was founded by Gov. Cuervo in 1706. In 1885 the railroad arrived, building their depot 3 miles east. 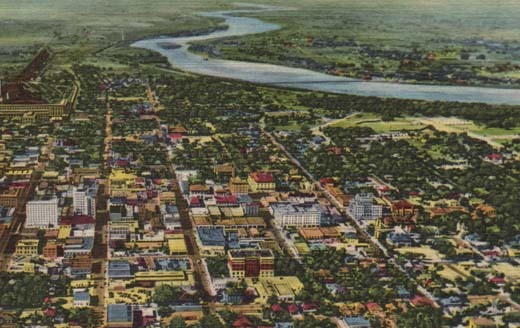 A new town sprang up around this and is now the largest city in the state with a population of 50,000 and is the leading commercial center between Kansas City and Los Angeles. 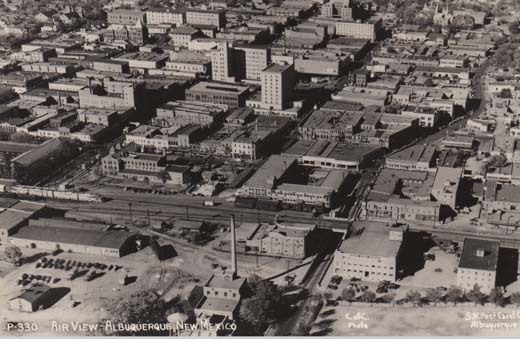 Air View-Albuquerque, New Mexico; C. of C. photo. S. W. Post Card Co. 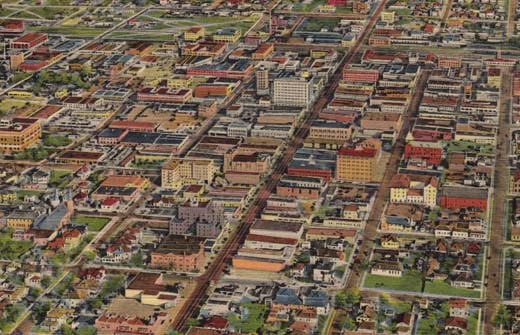 Showing the downtown section of the city with Central Avenue, Highway U.S. 66, going east and west and the Santa Fe Railroad crossing U.S. 66 north and south. 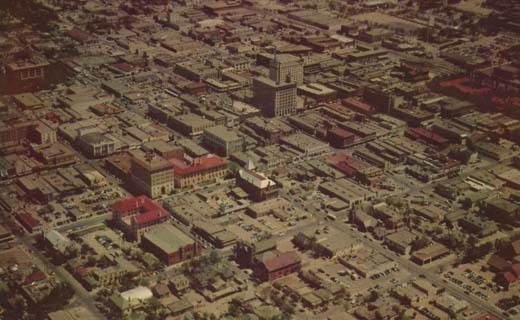 The famous Fred Harvey Alvarado Hotel and the Santa Fe Station can be seen in the center of the picture. This striking view shows the heart of the city with the well known Sandia Mountains in the background. The direction is to the east, where many business and new residential sections are under development.